Eating is getting harder and harder to keep up with. Even if I wasn’t strictly gluten-free, which limits a lot of food I can eat – I’m lucky that way, there is so much the average person has to be aware of now more than ever. When I walk into a grocery store, being a health conscious glutenfree-er, I have to look at everything. I read every label to make sure there is no wheat – wheat additive – rye – barley or any other particular gluten that I can’t have, check GMO produce codes, wild or farm raised; plus, I scan labels with my handy dandy fooducate app just to make sure I didn’t miss anything, hoping I didn’t miss anything. Who has time for all this? Sometimes I wish I had a healthy gluten free non GMO version of Willy Wonka’s 3 course meal in a single stick of chewing gum (tomato soup, roast beef, baked potato, blueberry pie and ice cream) and be done with it. When did food start getting so dangerous to eat? There are so many new, indecipherable ingredients, that not only can I not pronounce, but I’ve never heard of most as well. This is the ingredient list for a Big Mac bun, and I am just using McDonald’s as an example, my question is: does cheap, processed bread with no nutrition content what so ever, need that many ingredients? 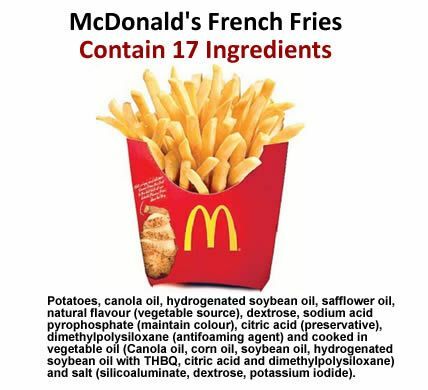 Or why the ingredients of french fries can’t just be potatoes & oil. Ingredients: Enriched Flour (Bleached Wheat Flour, Malted Barley Flour, Niacin, Reduced Iron, Thiamin Mononitrate, Riboflavin, Folic Acid), Water, High Fructose Corn Syrup and/or Sugar, Yeast, Soybean Oil and/or Canola Oil, Contains 2% or Less: Salt, Wheat Gluten, Calcium Sulfate, Calcium Carbonate, Ammonium Sulfate, Ammonium Chloride, Dough Conditioners (May Contain One or More of: Sodium Stearoyl Lactylate, DATEM, Ascorbic Acid, Azodicarbonamide, Mono and Diglycerides, Ethoxylated Monoglycerides, Monocalcium Phosphate, Enzymes, Guar Gum, Calcium Peroxide), Sorbic Acid (Preservative), Calcium Propionate and/or Sodium Propionate (Preservatives), Soy Lecithin, Sesame Seed. Not even the smell and taste of our food is real anymore, companies create aroma’s (artificial flavors) to make their processed yuck taste better, because we taste mainly with our nose. Anything that we smell has to contain some sort of volatile chemical — a chemical that evaporates and enters a person’s nose. The evaporated chemical comes in contact with sensory cells in the nose and activates them. In the case of taste, a chemical has to activate the taste buds. Taste is a fairly crude sense — there are only four values that your tongue can sense (sweet, salty, sour, bitter) — while the nose can sense thousands of different odors. Therefore most artificial flavors have both taste and smell components. Need a quick fix: take this pill, eat this bar, drink this miracle formula, have some 5 hour energy in a bottle. Don’t mind all the junk inside that you cannot pronounce, take it anyway, we promise you will feel better, fuller, thinner. How do we fix this pandemonium of sugar addiction we have going on? I wish I had the answer. I wish eating healthy and having more healthy options were as available as fast food. I wish a company like McDonald’s, recognized everywhere in the world, who sponsored the Olympics & the top athletes, more restaurants than any other restaurant chain, with the power to change the direction of our health, would change the direction of our health by using real food ingredients. Getting back to the basics and be more responsible about what they are feeding people. Of course McDonald’s isn’t the only problem, I realize this, there are many factors involved in being the most obese country in the world. Sometimes eating from the dollar menu is a choice between feeding your family and not eating at all. Sometimes it’s a quickie in between phone calls at the office, or where your friends hang out. Sometimes it’s just because the fries taste so dang good. Whatever the reason, more people eat at Fast food eateries or out, or from vending machines, then they do in their own kitchens. So what is wrong with expecting something far better from the fast food companies? The average person consumes about 60,000 pounds of food over the course of their lifetime, where is most of the average American’s food coming from? I think now more than ever, people are either already aware or becoming more aware of food ingredients and trying to make better decisions, educating themselves and becoming informed. Changing the food system as we know it takes a village and that village is growing and companies can feel the wave bubbling right below the surface. Hence, Kellogg’s coming out with their non GMO Cheerios and even though they say they have no intention of building off that line, the fact is, they did it. They did it because we the consumers demanded it. According to Barron’s Take, “McDonald’s has now announced five consecutive quarters of disappointing sales as fewer diners visit its restaurants. The company also warned that January sales would disappoint.” They also go on to say that companies like Chipotle, who have said no to GMO’s, chosen a healthier solution to their foods, happily offering safe gluten free, these companies are growing. I am a big fan of IN&OUT Burger as well. It is ultimately up to you, the consumer, where you choose to spend your dollars. But keep in mind that every dollar you spend is supporting that company and those ingredients you are ingesting. Make the choice to choose the village and one day we will bring change. I eat nothing at Micky Ds. Even the coffee makes my stomach turn!! Well said! Although reading EVERY food label is tiring, I love the fact that I know what I’m eating and feeding my family. My family suffers from multiple severe food allergies so we can’t just grab something from a store or restaurant. The new “trend” of natural eating won’t plateau, beause you’re correct in people are becoming educated on the food they choose. It’s unfortunate that larger big chains aren’t becoming healthier for people because it come down to $.